Hollandaise sauce is the Blessed Mother of sauces. It ups the delicious factor on any savory food tenfold. Steamed asparagus? Add Hollandaise. Salmon? Add Hollandaise. Eggs? 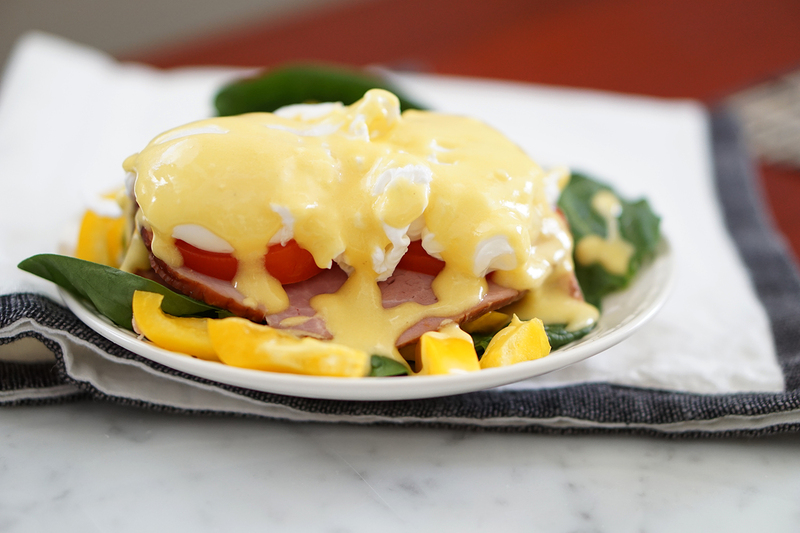 Sure, add Hollandaise…though that’s a bit like putting ketchup on your ketchup. Not only does this sauce rescue bland veggies, but it’s the main reason most people order Eggs Benedict when they go out to brunch (don’t argue with me). However, lots of restaurants put gluten in their Hollandaise. I’m not sure why, either. You can make it with 5 ingredients and 15 minutes, and it’s very easy after a batch or two. As a bonus, it adds good fats to your meal, along with the bajillion nutrients found in egg yolks. A note to my strict Paleo friends: this recipe cheats a little by using butter, but I personally find that grass-fed butter is a tolerable source of dairy for me. Plus it’s a superfood and one of the only sources of real vitamin A. So…I used it. I haven’t tried to make the sauce with anything else. Sorry. If you find a different kind of fat that works equally well, please let me know! If the sauce seems too runny, stick it in the fridge for a few minutes to let it solidify a bit. To warm up the leftover sauce, take the container out of the fridge and put it in a warm water bath to soften it. You can also do this if the sauce is too thick when you first make it. Do not, I repeat, DO NOT microwave it. It will devolve into a chunky egg atrocity that no one will want on their smoked salmon benny. Microwaving Hollandaise: not even once. Melt and cool butter to room temperature first. Separate egg yolks, then place in a blender. Add dijon mustard, lemon juice and salt. Blend on high for about 15 seconds. Turn the blender on low. While it's running, add the butter in a slow, steady stream. Keep blending until a thick sauce forms. Serve over eggs, vegetables, or really anything else. Hollandaise will keep in the fridge for about 5 days.